In order to contract with Cat and Mouse you must be over 18 years of age and possess a valid credit or debit card issued by a bank acceptable to us. Cat and Mouse retains the right to refuse any request made by you. If your order is accepted we will inform you by email. When placing an order you undertake that all details you provide to us are true and accurate, that you are an authorised user of the credit or debit card used to place your order and that there are sufficient funds to cover the cost of the goods. Whilst we try and ensure that all details, descriptions and prices which appear on this website are accurate, errors may occur. If we discover an error in the price of any goods which you have ordered we will inform you of this as soon as possible and give you the option of reconfirming your order at the correct price or cancelling it. If we are unable to contact you we will treat the order as cancelled. If you cancel because of the error and you have already paid for the goods, you will receive a full refund. All prices are inclusive of VAT. In addition, delivery costs will be charged. Such charges are clearly displayed in the shopping cart. We aim to dispatch most of our products, using Royal Mail and our couriers within 1-2 business days when products are held in stock, in our physical shop. However, dispatch times may vary according to availability and are subject to any delays resulting from postal delays or acts of god, for which we will not be responsible. If the items are not in stock because they have recently been sold in store, or the website has not recently been updated we will advise you of this and ask you whether you wish to wait or receive an immediate refund. Whilst we will make every effort to deliver within the time stated above, we will not be liable for any loss caused to you by late delivery. If you do not receive your goods within a reasonable time after dispatch, please notify us as soon as possible, either by telephone or email. We will follow up with Royal Mail and our couriers and endeavour to get your goods to you as soon as possible. We do not deliver to PO Box numbers. Neither do we routinely deliver to overseas addresses, because currently delivery costs are prohibitive, often double the sales price. Delivery costs to Northern Island and parts of Scotland are significantly higher than England, Wales and most of Scotland and therefore we are unable to deliver at the quoted price. However, if you live in these areas, or you are from outside the UK please email us for a delivery quotation and we will supply you with an accurate one. If you receive your item and it is faulty, please telephone us to let us know the extent of the damage. We might ask for a photograph to show the fault. The item will need to be returned to us in its original packaging with the invoice enclosed within 7 days. For faulty items we offer a refund of your order total and a refund of your return postage. Please speak to us before you return your parcel and we will let you know the best way to post it back to us and for some large items we can arrange for it to be collected from you. All the items dispatched are checked thoroughly for quality control before they are posted. Please note, all items are photographed prior to packaging to help us with any faulty claims after the item has been received. If you receive your item and it is not what you ordered please contact as soon as you receive us for details on how to return it. A full refund of your order total will be given once the items are received back to us in their original packaging and in perfect order. However, if the item is as described and photographed and you have just changed your mind we will not be able to offer a refund of your return postage. We realise how important it is to securely store any information that you provide. catandmouse.boutique maintains the highest levels of security. Our site uses high-level SSL encryption technology, provided by our payment gateway Sage Pay (not currently active) and PayPal You can therefore rest assured that we take the privacy and security of your payment and personal details very seriously. You can tell whether a page is secure as 'https' will replace the 'http' at the front of the www.sagepay.com in your browser address window. A small locked padlock will also appear in the bottom bar of your browser window. 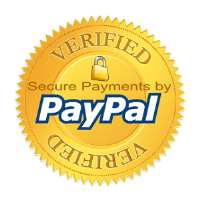 We also provide a Business PayPal payment option, which is also secure.